Another midnight bake. It was yesterday. I was feeling rather empty because I couldn't find any chocolates in my house. And I need to eat chocolates to erm...stay happy! Haha. So I had to find a chocolate recipe to bake. And I was yearning for a rich chocolate flavour. I settled for Patricia's Chocolate Cake with Caramel Ganache. By the time I finished baking, it was past midnight and I was sleepy and tired after all the washing up. After cooling the cake, I just shoved the whole cake inside the fridge. It was the first time that I did not taste it fresh from the oven. The very next day, I cut a slice for KK whom I was meeting for breakfast. At first I was rather reluctant to give him a slice. I mean, I did not have a taste it myself - what if it is inedible? What if it was too sweet? After all, this was the first time I baked this. But then, I was like, of well, he don't seem like someone who mind eating a horrible tasting piece of cake. So I just gave him a piece. And I was glad I did because he sms-ed me and said he enjoyed the cake. After I had a piece or two myself, I find that I love, love, love this cake. 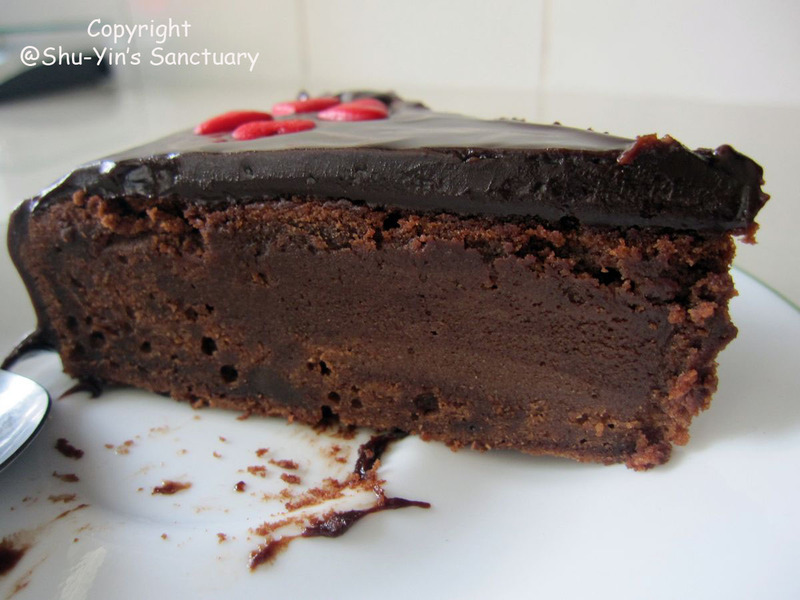 This is a very rich and decadent chocolate cake. The chocolate caramel ganache is nice. 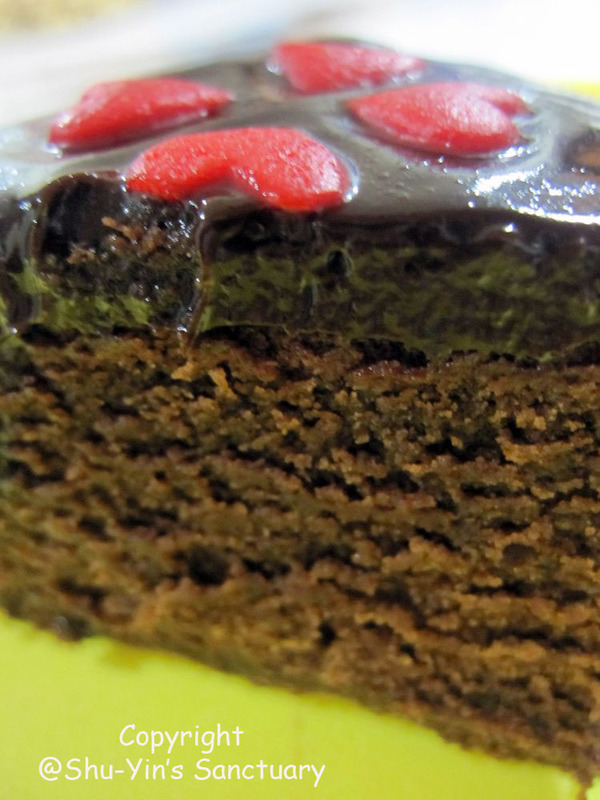 The cake itself is moist and velvety. And although rich, it is not too sweet. It really lived up to my expectation to satisfy my chocolate indulgence! My dad just came home from his China trip and being a chocolate lover himself, he loved the cake too. In fact, everyone in the house loved it, even my ah-yee who usually don't fancy too-sweet stuff. But like I said, this cake is not too sweet, just very chocolate-y rich! Shern also had a small piece but without the chocolate caramel ganache. Don't want my son to have too sweet a tooth at toddler age. Haha. A real decadent and sinful desert indeed! Preheat oven to 160°C/320°F. Butter a 20cm round cake pan, line the bottom with baking paper and butter the paper as well. Place the butter and sugar in the bowl of an electric mixer and beat until light and creamy. Add the eggs, one at a time, and beat well after each addition. Beat in the vanilla. Sift the flour, baking powder, cocoa and salt over the butter mixture, add the sour cream and chocolate, and mix until just combined. Pour the mixture into prepared pan and bake for 35-40 minutes or until just set and a skewer inserted in the center of the cake comes out clean. Cool in the pan over a wire rack. Carefully unmold onto a place, then invert in onto a serving plate, top side up. Place chocolate in a heatproof small bowl. Set aside. In a small saucepan, mix the sugar, water and corn syrup, being careful not to splash the mixture on the sides of the pan. Cook over high heat, without stirring, for 4-5 minutes or until golden – keep an eye on the caramel so it doesn’t burn, otherwise it will taste bitter. Meanwhile, in a small saucepan, bring the cream to a boil over medium heat. Remove from heat. When caramel is golden, remove from heat and set aside for 30 seconds. Carefully – because it will bubble like crazy – add the cream to the caramel, mixing for 1 minute. Add this mixture to the chocolate and set aside for 2 minutes. Then, starting by the center of the mixture, stir until ganache is smooth. 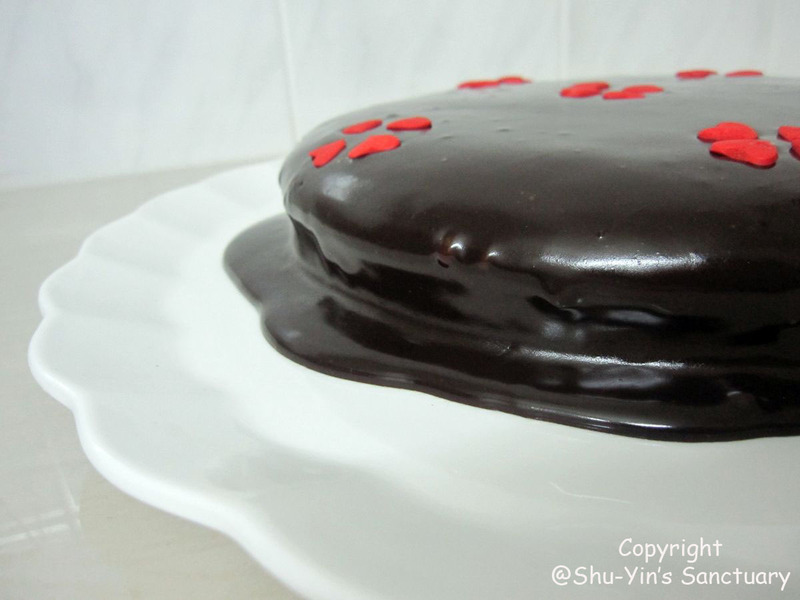 Allow the ganache to stand for 5-7 minutes before spreading over the top of the cake. mindy...then u shd try this recipe out, but only if u absolutely love chocolate. if not, it will be a too rich cake for u.
too bad yh dont like sweet stuff. bake this cake and share with genny when she is back. hahaha...i dowana open cafe la. have to bake the same cakes again and again wan..no shiok. i like to try out new recipes. hehe. that is y i seldom bake the same thing twice. Baked this recipe today. By the way, I'm a chocolate lover, especially bittersweet chocolate. Sad to say that this recipe is rather dry and crumbly. I used the normal ganache and not this caramel ganache. Quite difficult to eat. 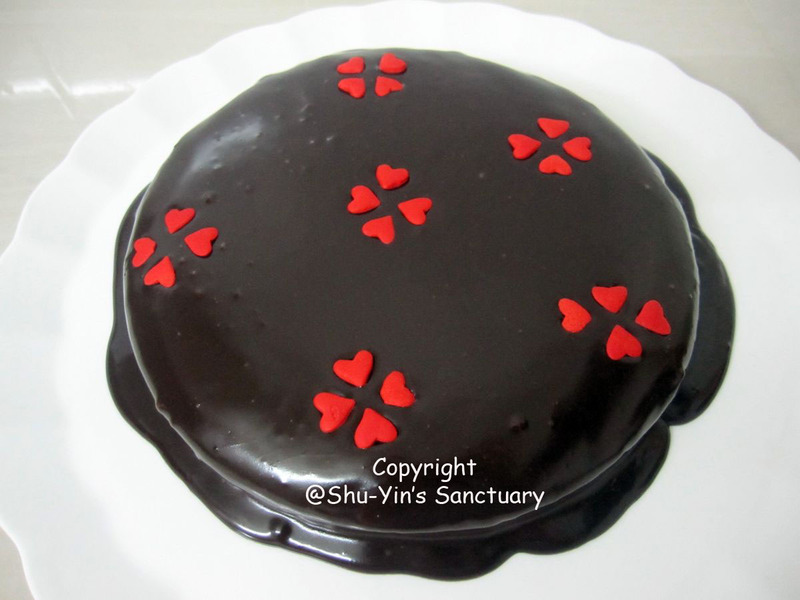 Do you have a really good & moist chocolate cake recipe? im not sure why yours turned out dry n crumbly. as u can see from the photos ive taken, this cake is really very moist and rather fudgy. the cake by itself without the caramel ganache is also moist. that is y i love this cake. im so sorry why yours didnt turn out the way it shd be. mebbe u can try again. Yea yours looked so moist & fudge, unlike mine. Probably my measurement for butter was wrong but I like the strong chocolaty flavour though. Instead of throwing the whole cake away, i whipped up some cream with royal raisin ice-cream to go with it. Tastes better but again my cream can never gets whipped up-just don't understand why. I will try the recipe by joy of baking. 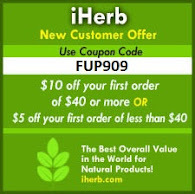 I am also one of the follower of that blog. Thanks for sharing. Cheers-Jennifer.